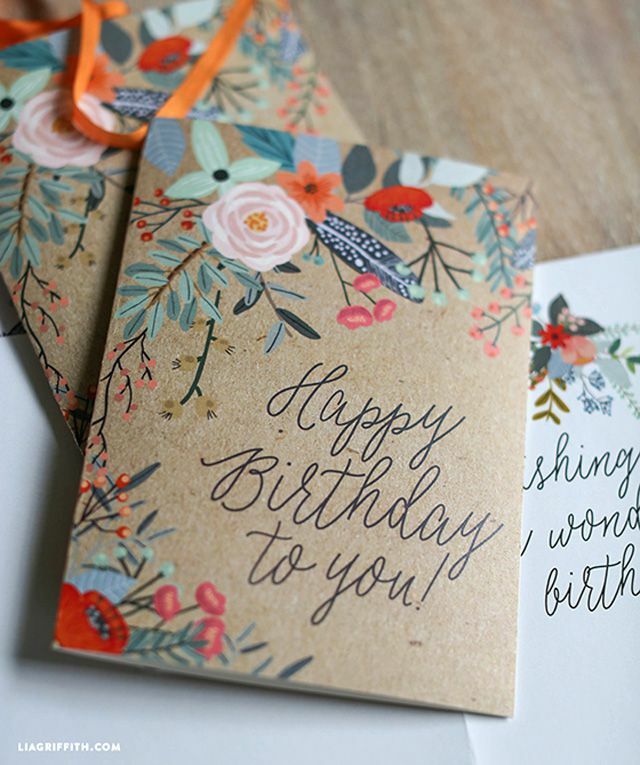 For a special handmade touch, opt to make your next birthday card rather than picking up a generic store-bought card. Your friends and family will surely appreciate the effort and become awestruck by your talent (no need to tell them just how easy it was to make). Check out these 25 ideas that range from simple and beautiful to quirky and clever. Continue to 2 of 26 below. Many crafters want to make their birthday cards to give to their friends but just don't have the time or money for expensive supplies. Kristina Werner to the rescue! Watch her video tutorial which demonstrates just how easy it is to make these fabulous watercolor birthday cards for pennies. Continue to 3 of 26 below. Almost every little boy or girl goes through a "dinosaur" phase. Make this cute dino card to celebrate their interest and special day. Continue to 4 of 26 below. Craft a birthday card that is beautiful and looks much more complicated to make than it is. Paper dyes help give the lettering and paper balloons a professional edge. This craft project is a card that everyone would appreciate and love to receive. I don't know anyone who doesn't adore sprinkles! Why not add some fun to a birthday card? Paper lollipops are covered with sprinkles and glued onto a matching card. How cute! The inner child in all of us will just love a birthday greeting like this! Continue to 6 of 26 below. The letterboard design trend is going strong. Make a card using a sentiment that is personalized for the recipient in this cute style. How trendy! Continue to 7 of 26 below. Washi tape has got to be one of the best inventions ever! Add some cute tape to your greeting card craft, and you will have a beautiful card in an instant! So easy and so much fun! Anyone can get great looking cards and envelopes instantly with washi tape. Continue to 8 of 26 below. Celebrate a birthday with this adorable pom ice cream cone card. White House Crafts offers a free printable and tutorial for this card project. Very cute! Add some craftiness to your birthday card projects with embroidery. When you finish the embroidery, attach some fabric tags to keep up the handmade theme. Lovely! Continue to 10 of 26 below. Try something different for your next DIY card project. Most cards are made with white paper. This time use black paper for a dramatic twist. Your friends will appreciate the effort you put in to give them a card that is unique! Continue to 11 of 26 below. Most crafters have bits and pieces of leftover paper that are simply too beautiful to throw away. Put those scraps to good use with this cute birthday candle card. Continue to 12 of 26 below. A shaker card has a transparent panel on the front and is filled with materials that move around when shaken. This adorable birthday card features a balloon on the front that is covered with tulle and filled with confetti. The birthday recipient will treasure this keepsake card! Glue some chapstick or lipstick to the front of the free printable butterfly card, and you will have a lovely present as well as birthday greetings! Perfect for the teenage girl in your life. Continue to 14 of 26 below. Some people love cards that have a vintage look. This project is made with stamps, dies and colored with pencils. Butterflies are stamped, then colored with Prismacolor pencils and attached to the base of the card. The result is a beautiful, feminine card that is perfect for the woman in your life. Continue to 15 of 26 below. Are you short on time but still want to give someone special a DIY birthday card? Let Lia Griffith do the work for you. She offers this lovely black and gold card for download on her site. All you have to do is print the card. Lia has done all the artwork for you. A win-win for all concerned. Continue to 16 of 26 below. Landmark birthdays deserve special recognition! Although the example on the card is for an 80th birthday celebration, you can alter the card for any birthday. Just print out the numbers and sentiment using your favorite word processing software. Then cut and glue to your card backing. So easy and so cute! Fabric flowers attached to a white card are simply lovely. Some added stitching completes the look. Continue to 18 of 26 below. The is always elegance in simple design. Make a lovely sunflower card for that special friend that celebrates an autumn birthday. Continue to 19 of 26 below. Do you sometimes feel like an ATM machine when it comes to your children? Add some humor to their birthday with this funny ATM-style birthday card. Continue to 20 of 26 below. Pop-up cards are always fun to make. This pop-up birthday card is more straightforward to make than it looks. The tutorial also has an easy to follow video, that all but guarantees success with this craft project. A lotto card is the perfect small birthday gift when you don't want to spend a ton of cash but still wish to give a little something to someone on their birthday. Download this free printable card from C.R.A.F.T. and insert a lotto ticket. So fast and so easy! Printable Lotto Birthday Card from C.R.A.F.T. Continue to 22 of 26 below. Sometimes the best birthday gift is cold hard cash! Make a cute card with a shopping bag on the front, and insert some money. Your birthday person will love it! Continue to 23 of 26 below. Make a birthday card that also doubles as a mini album. This card will be treasured for years to come. Continue to 24 of 26 below. Do you have someone in your life that loves sign language? Make them this card with the I Love You sign on the front. Hand drawn cards are always a welcome gift because you took the time and effort to make something special for your friend. Metallic gold ink on purple cardstock is a winning combination for this DIY birthday card. Continue to 26 of 26 below. Painted flowers printed on card stock always look lovely and feminine. If you are looking for a beautiful printable that you can download, this card will most certainly meet your requirements. What Are the Best Card Making Supplies and Tools for Beginners? Make some cash for your organization with printable notecards!